I want to write this topic a few years back, but never have had the chance to write a blog about it. When I had time to write the topic, I don’t have the access to the real case. When I have the access to the real case, I was busy in taking care of other stuffs. Finally, I have time and real case to discuss this topic and this is the main purpose for this post. There are tons of articles and blogs discussing Direct Path Read and Buffer Cache Read and I am not going to repeat their findings. The good ones are Tanel‘s Optimizer statistics-driven direct path read decision for full table scans, Alex Fatkulin‘s 11G adaptive direct path reads — what is the cached/dirty blocks threshold?, Doug Burn‘s 11g and direct path reads and Frits Hoogland‘s Investigating the full table direct path / buffered decision. These are very good articles and have many test cases you can play with in your environment. This post discusses the processes and steps I use to analyze the performance issue related to Direct Path Read from a production environment. For direct path read, SGA is bypassed and the blocks are read directly into PGA. Direct path read is faster than scattered reads because it can avoid latches. But on the other hand, oracle needs to count the total number of dirty blocks in the memory for each table/segment or go though the checkpoint queue to count the buffers. The checkpoint is done for the segment to make all the blocks of the segment up-to-date. You could see enq: KO – fast object checkpoint event just before the direct path read. The performance issue related Direct Path Read is from a small 12c production database with only 4GB SGA and buffer cache is about 2.5 GB. This query is pretty simple, just doing full table scan. Although the query can complete within half second, the total number of executions make it always top 5 queries in the database. I made a recommendation to add an index before this incident happened, but the recommendation has never been approved and implemented in the production. Before the issue happened, the query is mainly on CPU, see the screenshot below. When the issue happened, it shows significant Direct Path Read event. To find out why there was sudden change in the query performance, I did some analysis to investigate why it happened. 1. The query is still using the same plan with the same hash value. So I can rule out the possibility that performance was caused by a plan change. 2. The average LIO is roughly no change with about 4,900 before 8:30pm on Mar. 29. 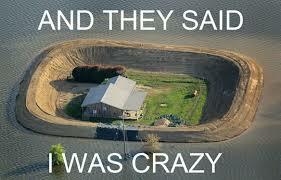 Then suddenly shot up 6,457 half hour latter. Then to 11,000 for the rest of day and Mar. 30. The performance issue happened around 2am Mar. 30 when almost same physical IO (PIO) as LIO happened. I can see the average run time shot up from 0.032 to about 0.23, about 8~10 times slower than before. I know this sudden change to direct path read is very likely caused by _small_table_threshold. _small_table_threshold is a hidden parameter that defines the number of blocks to consider a table as being small. You can use the following query to find out this value. Unfortunately I don’t have the access to the X$ tables. So I use another way: 2% of buffer cache. I have verified this number in the past and my tests shows value of _small_table_threshold is somewhere between 1.84%~2% of buffer cache. For small table, full table scan always read into buffer cache. If size of the table or segment > 5*_small_table_threshold or 10% of buffer cache, then the table/segment is considered Large table and always uses Direct Path Read. For table between small and large table, it is Medium size table, i.e, between 2% and 10% of buffer cache. For Medium size table, sometimes it uses Direct Path Read and sometime it uses Buffer Cache Read. One popular opinion is when 50+% of table blocks are in buffer cache or dirty, the full scan uses buffer cache read while direct path read covers the rest of scenario. Frits’ article discussed his tests on 12c database and said for medium size table, 50% dirty rule still hold true for buffer cache read, but at least 99% of blocks in buffer cache can make full table scan use Buffer Cache Read instead of Direct Path Read. For majority of cases, it’s unlikely to have 50% blocks in a segment changed in a short time. It’s also unlikely to have almost all blocks (99+%) in the buffer cache for a busy database. So if Frits’ opinion is correct, we will likely to see Direct Path Read for a full table scan once the table/segment size exceeds _small_table_threshold. The value of _small_table_threshold is in block counts. The block count is taken from statistics in the data dictionary. 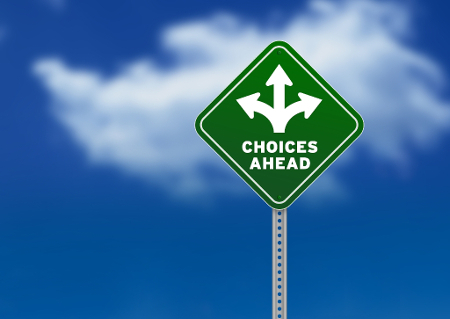 But optimizer does not make the decision for direct path read, it is a run time decision done during every execution. Parallel queries are always using direct path read. For non-parallel queries, the change of current buffer cache size or the number of blocks in the cache will have the impact in the decision to go with direct path read or buffer cache read. If you feel RDBMS does not make correct decision to use direct path read, you may try _serial_direct_read parameter at session level, which I would not recommend doing so. Ideally I would use X$BH to find out the number of dirty blocks. Unfortunately I don’t have the access to X$BH. Instead I check out dba_tab_modifications to get rough estimation whether there are many changes in the table. , ( m.inserts + m.updates + m.deletes )*100 / case when t.num_rows is null or t.num_rows = 0 then 1 else t.num_rows end "Change Factor%"
There is only 1.16% of rows get modified since last analyzed time one night before, far below the 50% dirty threshold. So I can rule out the possibility from dirty blocks. I run the following query to show the size of buffer cache and 2%of buffer cache in MB and blocks. We can see the 6,390 blocks is the magic number that will decide whether the table is a small table or not. Remember the decision related to use direct path read is not based on the current size of table, but the value at the time when last stats was captured. So I run the following the query to get the latest stat info related to the table. Ok, 11131 blocks is greater than the small table threshold of 6390 blocks. So the table size is definitely the factor triggering the direct path read. Then my next question is that why this thing happens right now, but never in the past. It might be considered as small table in the past. Run the following query to check out the stats history for the table. The result clearly shows all of the block counts are less than 6390 and the table was always considered as small table in the past. Am I done with the analysis? Not yet. If you look at the above result carefully, you will notice the pattern change to “ON CPU” again between 22:30 and 2am next day. I verified the table size did not change and the table is still considered Medium size table. It becomes more interesting. Then I observed the same behavior during the same timeframe the next day. At this moment, I know it could relate to Oracle’s AUTO Jobs, which are running during the same timeframe. Yes, I indeed found some SQLs from SQL Analyzer with the query like this /* SQL Analyze(2722,1) */ SELECT CLIENT_ID,STATUS,SHP_ID FROM INV_APP_NRD.SAL_SHIPWS WHERE CLIENT_ID = :1. I guess this SQL analyzer loads all blocks from this table into buffer cache. It forces the run time decision to use buffer read instead of direct path read. After 2am when some blocks are flushed out of buffer cache and total number of blocks of this table is below certain threshold, maybe 99% as Frits pointed out, then the run time decision would favor direct path read. For very large table, if queries do the full scan of the table less frequently, say, once a week, there is no point to place these blocks in the buffer cache and you want to use Direct Path Read. For full scan of tables no matter whether large or small, if happens very frequently, then the large number of executions of the query using Direct Path Read will make the SQLs expensive. One way to check the cardinality of the predicate in the query and add an index if necessary. Actually this is the top recommendation I made for this query. Adding a new index on CLIENT_ID will scan only less than 50 rows instead of 1.9 million rows. In case you can not tune the query, increasing SGA size will be your next option. If increase SGA size, the db cache size will increase. It means the increase of the value of _small_table_threshold. This is another common solution. You could change the value of _small_table_threshold parameter. But I don’t think this is a good idea to touch this parameter. This is an interesting solution I have never used or tested before. But theoretically it should work: using ALTER TABLE tableName CACHE. Please note, it does not mean storing all blocks from the table in the buffer cache, but just tell Oracle to handle the blocks differently when they get into the cache. In other words, the table would be ALWAYS treated as small table regardless of the actual size of the table. When you create or alter a table, you have 3 options: CACHE, or NOCACHE, or CACHE READS. NOCACHE is the default value and this is what everyone uses for the majority of tables. When oracle is doing a full scan of a table/segment, it places the blocks onto the least recently end of Least Recently Used (LRU) list in the buffer cache. So it makes these blocks more prone to being aged out of the buffer cache. So for some data that is accessed frequently, CACHE allows you to place the blocks of the tables at the other side of the list, the most recently used end of LRU list, when a full table scan is performed. CACHE READS applies only to LOB storage. It’s useful when you want to bring LOB values into the buffer cache only during read, not during write operations. By the way, when creating table with LOB column, you could specify CACHE option in the LOB_storage_clause to places LOB data values in the buffer cache for faster access. By the default, both BasicFiles and SecureFiles LOBs is doing NOCACHE LOGGING. The downside of caching LOBs is when not using carefully, the flooding of cache of LOB object would force rest of database data out of buffer cache and have more Disk Read rather than cache hits for non-LOB data. This is uncommon behavior and SGA increase could improve the performance from this issue. 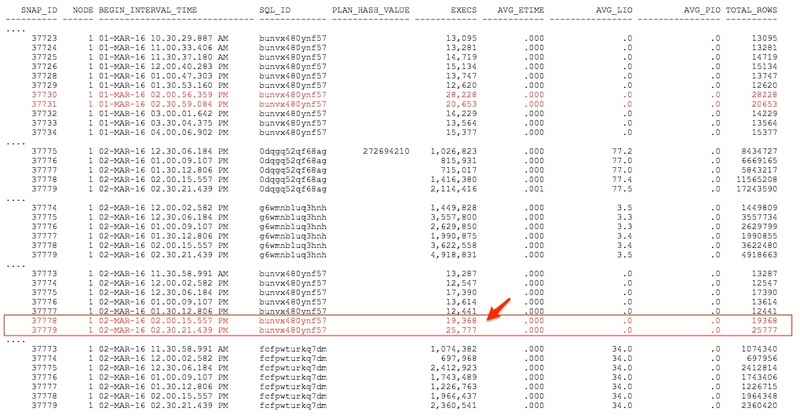 Before Oracle 12c, PGA_AGGREGATE_TARGET is the most useful parameter to control PGA memory allocated to work areas. However PGA_AGGREGATE_TARGET is a soft target and not a hard limit. The actual PGA usage can be as high as three times of the value of PGA_AGGREGATE_TARGET. Excessive PGA usage can lead to memory swapping issue and have impact on the performance. There are many articles and blogs discussing this parameter and tuning technique and I will not repeat more here in this blog. Instead I am going to discuss more about a new PGA related parameter PGA_AGGREGATE_LIMIT. PGA_AGGREGATE_LIMIT is a new parameter introduced in 12c. It put a hard limit instead of a soft limit on the PGA memory usage. 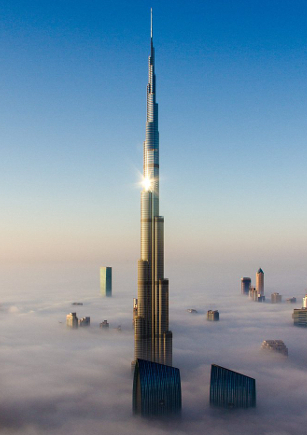 It just like we need to put a limit to the height of skyscraper and some of them are away too high. If this limit is reached or exceeded, Oracle will terminates the sessions that are consuming the most untunable PGA memory. I have more detail discussion about tunable and untunable PGA memory at the end of this blog. Recently I was requested to help my client to investigate a PGA memory related production issue and it was all related to PGA_AGGREGATE_TARGET, PGA_AGGREGATE_LIMIT and user application. 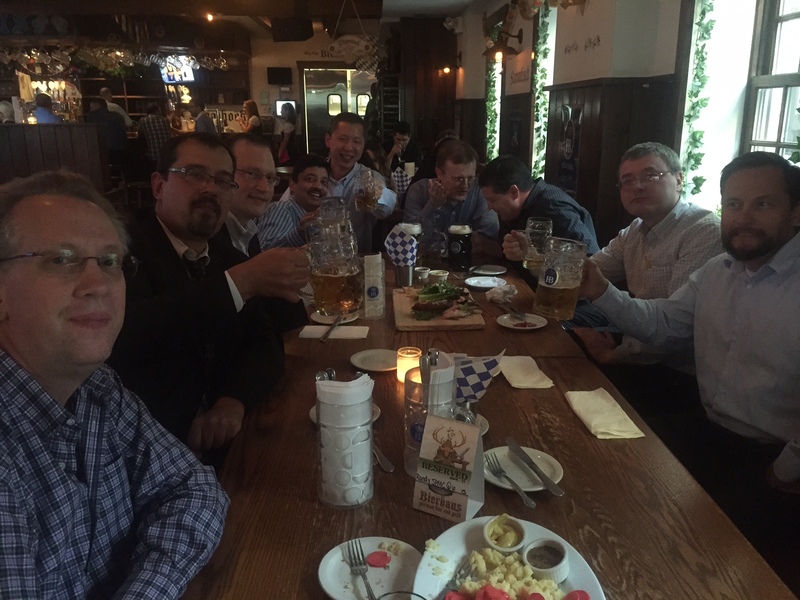 The database is a small 12c database with not much activities. The PGA_AGGREGATE_TARGET is set to 2GB and it is usually sufficient as PGA Cache Hit Ratio hits almost 100% based on the result from v$pga_target_advice. PGA_AGGREGATE_LIMIT parameter was not set at that time. So it took a default value that was dynamically set by the system. By default, Oracle uses the following 3 ways to find out greater of three values and use it as the limit. 2. Two times of PGA_AGGREGATE_TARGET parameter , 2 GB x 2 = 4 GB in our case. 3. The value of PROCESS parameter * 3MB. The PROCESS is 300, so the value is 3MB x 300 = 900 MB. Therefore the actual limit was 4 GB for PGA_AGGREGATE_LIMIT parameter by default. Less than one week before the incident, I requested the execution of edb360 and execution result was indeed confirmed the PGA_AGGREGATE_LIMIT parameter was 4GB. Obviously, we have a situation with PGA_AGGREGATE_LIMIT reached. As always, client’s next question would be: Does this issue happen before? Which application or process triggered this issue? Does this issue happen before? To answer the question whether this issue happened before, I used one query from Carlos Sierra‘s edb360 and modified the code a little bit to allow me to capture the PGA allocation and usage for the past 60 days. Captured and imported the result into Excel spreadsheet. 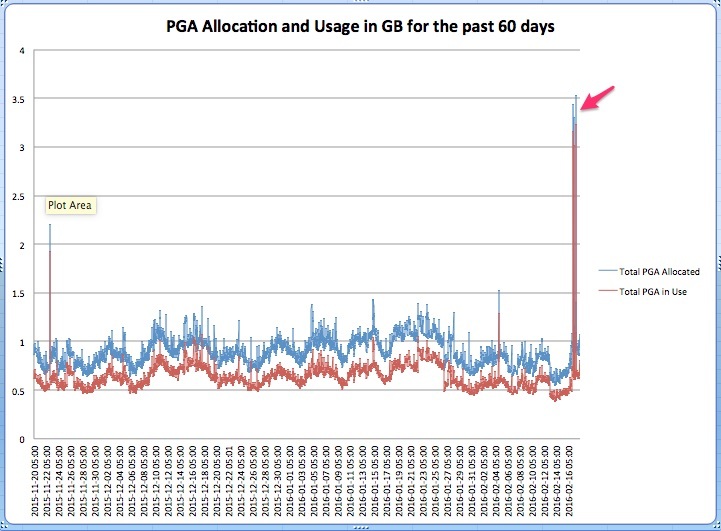 Then I created the following two charts showing PGA allocation and usage for the past 60 days and 7 days. 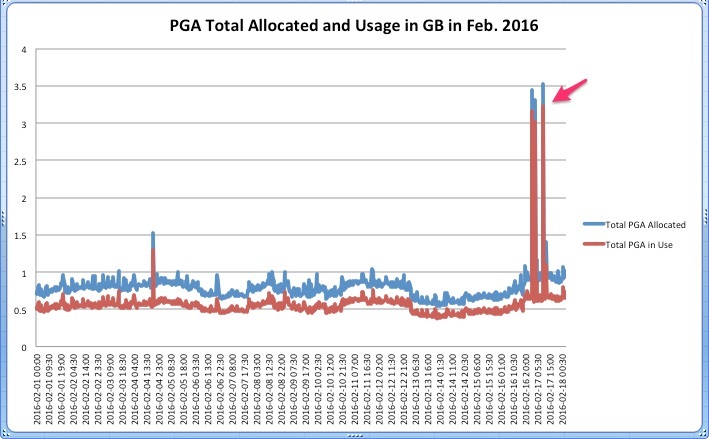 The 60 day chart shows there is no event of PGA limit reached until the date of the incident and the majority of the PGA allocation/usage is between 1 GB and 1.5 GB. At the date of the incident, it had the spike to 3.5 GB. As the data is pulled from the snapshot and has average down effect, so the value is 3.5 GB instead of 4 GB. But that’s good enough. 7 Days chart shows the same issue happened twice at the same date of the incident. Which application or process triggered this issue? Ok, let me find out who is the guilty one. I pulled PGA usage information from historical active session history (dba_hist_active_sess_history) and sorted by PGA usage in descending order. Not surprisingly SQL ID cmdzs9ud02bdb is the only SQL that has PGA usage > 1G and there are 605 occurrences. We can also see the top occurrences were around 4GB, reaching to the limit of PGA_AGGREGATE_LIMIT parameter. 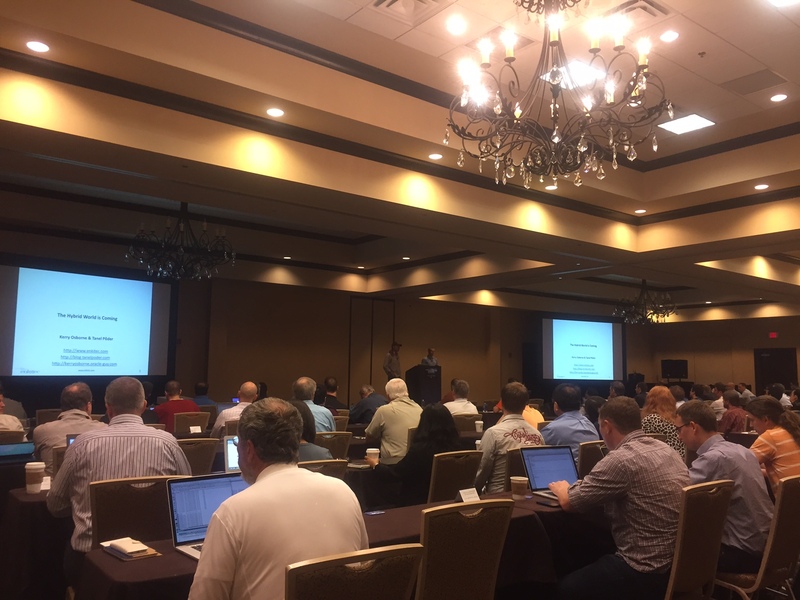 Pay more attention to XMLTABLE EVALUATION. If not careful, anything related to XML can cause a lot of performance headache. Is this SQL a new SQL or an old SQL? For a query with performance issue, The first thing I usually check is to use Kerry‘s awr_plan_change script to find out the SQL history and performance. The result from awr_plan_change shows this is an old SQL that had executions as early as 6 months ago. The query cmdzs9ud02bdb performed good until Feb. 16 and Feb. 17 was date that had this performance issue. 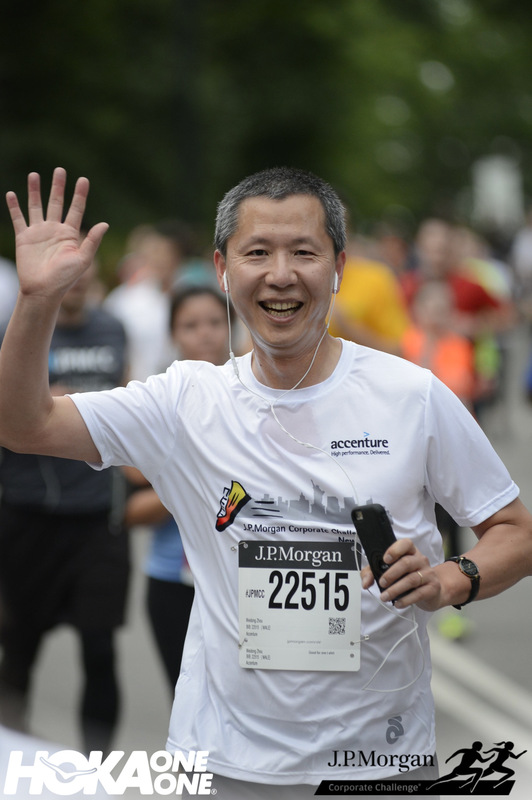 Looking closely, there is no plan change and the key difference between these good runs and bad runs is the the total number of rows returned. Good runs usually return a few thousand rows at most while the bad run on Feb. 17 returned 11 million rows before blowing out the PGA memory. 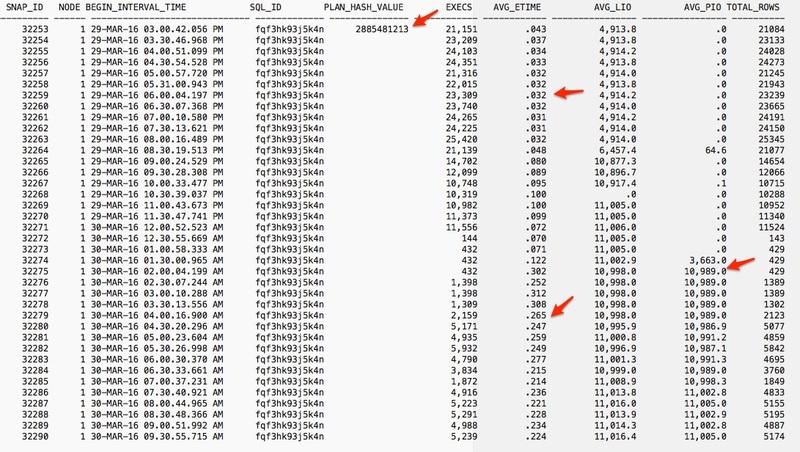 PL/SQL and XML are untunable PGA memory and no wonder Oracle decided to kill this SQL first. I have no insight information about this query from application side. But purely from database perspective, it doesn’t seem to be a good practice for this query to return 11 million rows of result to application layer. Interestingly, the next day the query performed normally and returned just a few thousand rows. Coincidentally, there was a production application upgrade just the night before the incident and I do not know whether it was related or not. Anyway, I believe this is an application issue instead of database issue. 1. To monitor the limit is reached or not, Oracle uses CKPT process to checks the limit every 3 seconds. If the limit is reached or exceeded, then CKPT terminates calls for the sessions using the most untunable PGA memory. Tunable PGA memory refers to the part of PGA memory that is allocated for SQL activities like sorts, hash-join, group-by, bitmap merge and bitmap index create. This part of memory can be shrinked or expanded based on the system load. Untunable PGA memory refers to other part of the PGA memory that can not be shrinked, such as PL/SQL, Java, context information for each session or for each open/active cursor. The size of tunable memory can be found from “aggregate PGA auto target”. Make sure aggregate PGA auto target should not be too small compared with the value of PGA_AGGREGATE_TARGET because we want to have enough PGA Memory left for workareas. The ‘maximum PGA used for auto workareas‘ gives the maximum reached by previous statistic since instance startup. If untunable PGA memory + minimum tunable memory required to execute the work area workload > PGA_AGGREGATE_TARGET, over-allocating PGA memory can happen and extra PGA memory allocation beyond PGA_AGGREGATE_TARGET occurs. We can see this number from over allocation count and you want this number as small as possible. As CKPT process checks the limit in 3 second interval, it is possible for PGA memory usage to briefly exceed PGA_AGGREGATE_LIMIT and return back to the level below limit. 2. According to Oracle Doc Limiting process size with database parameter PGA_AGGREGATE_LIMIT (1520324.1), there is no difference in behavior between PGA_AGGREGATE_LIMIT being explicitly set or being set to the default. Because the parameter responds to changing memory conditions, you do not need to set the parameter value explicitly. The document also states: If a value of 0 is specified, it means there is no limit to the aggregate PGA memory consumed by the instance. I believe this statement doesn’t mean we could use unlimited memory in PGA, but just consider this PGA_AGGREGATE_LIMIT not exists anymore and 3xPGA_AGGREGATE_TARGET is the limit for PGA usage.